The Bicycle Coalition of Maine is proud to announce that Coalition members Victor Langelo and Nicole Anderson have each won a half-week BikeMaine Scholarship. We’re looking forward to riding with you both! 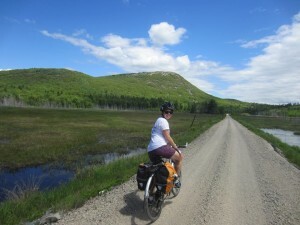 Victor loves riding in Maine and is a tremendous proponent of bicycling. He lives in Topsham and is trained as a Bicycle Coalition of Maine advocate thorough our Community Spokes program. He organized the Brunswick-Topsham Trail Coalition working with snowmobile riders, hikers and bicyclists, has done significant fundraising for a local trail segment that will eventually help connect to the existing Brunswick-Topsham Trail, and volunteers and rides regularly with the Merrymeeting Wheelers (he won their “golden sprocket” award last year). 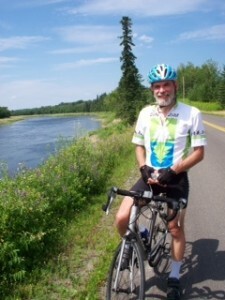 He’s a stalwart on the Merrymeeting Trail committee, and has twice led rides from Gardiner to Bath to familiarize people with this possible future trail, and to promote the trail to local businesses along the way. Nikki is 29 years old and a resident of Portland. She is a year round bike commuter, member of the Portland bicycle pedestrian advocacy group and Meetup bike ride leader in Portland. She usually does a bike tour each year with her husband, but could not afford to do so this year as they are preparing to buy their first home. Our thanks to Anthem Blue Cross and Blue Shield of Maine for allowing us to recognize these two very active members of the Bicycle Coalition of Maine for their passionate commitment and great work, with a scholarship to ride a half-week of BikeMane 2014.